Sometime today or tomorrow I have to go to Lowes and order my washer and dryer and order the carpet in our master bedroom/living room. Husband is working furiously, trying to finish up the hall flooring. I have been working in the kitchen, organizing my kitchen cabinets, pantry etc. The washer and dryer has to be ordered by a certain date this month. Fortunately, I don't believe they will be delivered until AFTER Jan 1, 2017. That is a relief. 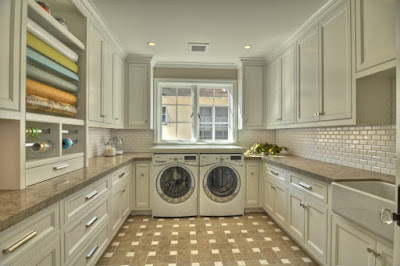 We can then work on the laundry room. The carpet has to be scheduled for the measurements. That would mean, I will not be able to put the tree up until after the carpet is installed, sometime in December. Is that really such a big deal? Maybe we could move the tree...Maybe I should just do what really needs to be done, instead. I have to get that master bedroom painted. I'm trying to get some help from my adult sons - I'll see them Saturday night. Both of them, could probably knock it out in a day, if I do the cutting in. I can't wait till this major stuff is done. The original goal, was to have all of this done and over with, so I could rest up through the holidays. Guess, that is not going to happen. 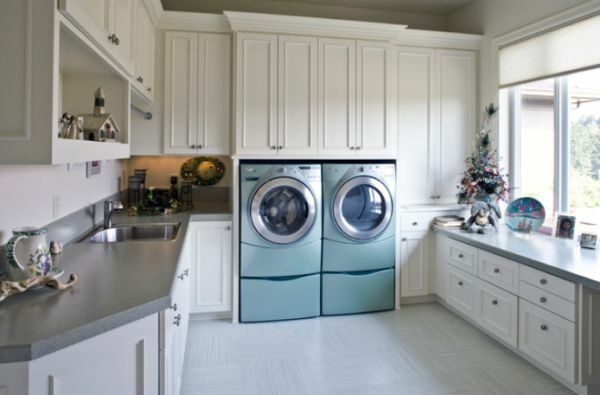 Those are fabulous laundry rooms! Yep, I can't wait till I get mine the way I want. Laundry will be fun again.